Do you ever have days where all your yoga and meditation training kicks in and you inhale peace and exhale gratitude? The last few days have been like that for me. I have three cats and the two pictured are Jack and Sox. 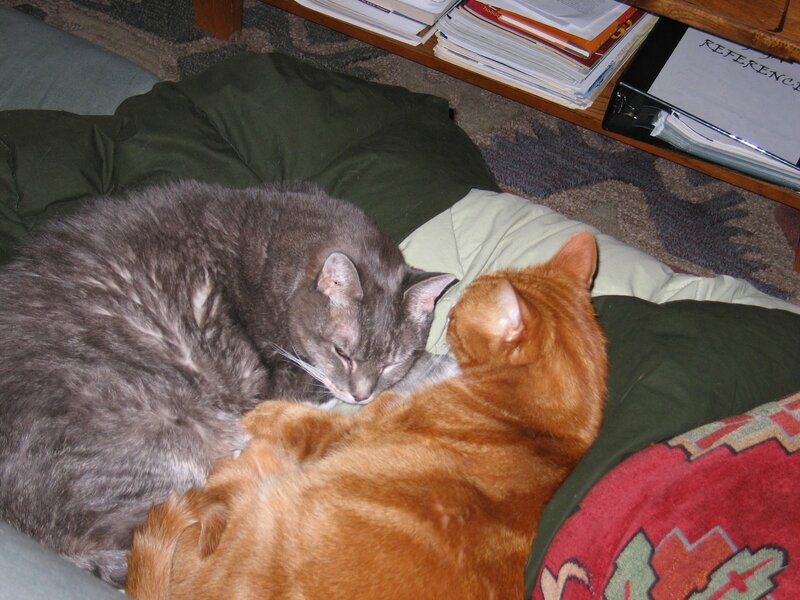 Sox is 16 and Jack is the grey tabby, 15 years old. They were both strays when they came into our lives. Jack has been diabetic for about nine years and I give him a shot of insulin every day. Just like a human diabetic, he has his ups and downs. He has hypoglycemic crashes, which can very scary and heartrending. He goes through long periods where his diabetes is regulated and then his body goes wacky and I have to rush him to the vet…like last night. When Jack begins to crash I try to help by giving him corn syrup to raise his glucose but last night it didn’t work. His head starts shaking, he starts staggering around, his back legs go out on him, and he literally becomes blind. He is helpless. When we got him to the vet, his blood sugar was so low it did not even register on the glucose meter and his temperature was 95 degrees (cats are usually around 102.) The emergency vet started a glucose IV and put him on a heating pad. He is still at the vet’s office as I type this. The bill for last night was $410. On top of all this, starting today I am getting a hardwood floor refinished. After the carpet was pulled up the refinisher told me that some of the spots were so badly damaged by cat urine that the wood has to be replaced, adding $400-$600 to the original cost and an extra day. The reason there’s cat urine is that (1) Jack is diabetic, and (2) he’s an old cat, and old cats sometimes forget to use the cat box. Yes, Jack is problematic and over the years he has cost us a lot of money in vet bills, but in good conscience I can not put him to sleep to make things easier for us. I know that many people would put a cat like Jack to sleep and have no second thoughts about it. I know that people put their pets to sleep when the cost of vet care becomes too much and they can no longer afford to care for them. I know that some people would take a cat like Jack and dump him on an expressway or out in the country. There are many throw-away animals in this world. As for the floor, the refinisher was more upset than I was about the added cost and extra day. But I looked him in the eye and I said “I’m a yoga teacher, and if there’s one thing I’ve learned, that’s to go with the flow.” I told him that things can always be worse and I am not going to get upset about things that I have no control over. I told him that I am not going to create my own suffering by becoming upset. He said that I was right and that maybe he should remember that for himself in the future. Yeah, I wish I did not have a diabetic cat, I wish he did not cost beaucoup bucks to keep well, I wish the floor job wasn’t going to cost an extra $500 because of him. But wishing for reality to be something other than it is creates suffering. I am not going to dwell on those negatives because things can always be worse. I am just grateful that we are in a position to be able to afford these emergencies, many people can not. There was a time back in the day when I could not. There was a time back in the day when I could not afford medical care for myself. I try to live my life from a state of abundance, and not with the attitude of lack. I know people who have much more than I have materially, yet they live their lives as if they are lacking something. I am grateful for all that I have…even for an old sick cat. Previous Post are you peaceful today?